Click on the logo below to get to the 2019 Lexi Kretsch Softball Scholarship application form! We are a premier fastpitch softball club supported by community associations in Plymouth/Wayzata, Chanhassen, Chaska and Minnetonka. We are based in the West Metro. The primary objective of the Minnesota Vortex program is to provide our version of the best possible fastpitch softball experience. We provide a high level of play and instruction, as well as a consistently challenging and FUN experience for our players. We are committed to providing excellent coaching and player development. The Minnesota Vortex provides the opportunity for year-round development and training, while recognizing the importance creating well rounded, confident athletes and citizens. 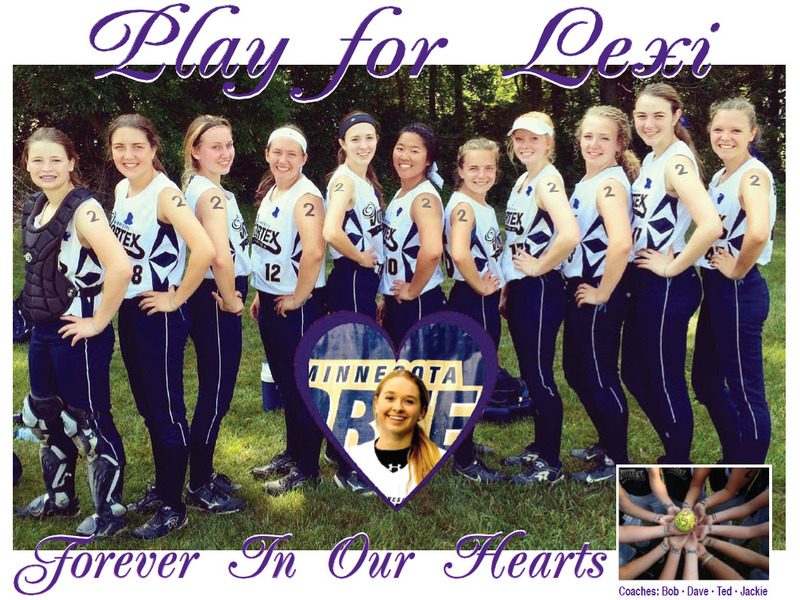 During the primary softball season, our Minnesota Vortex players make softball their priority sport. Our off-season work consists of individual instruction, clinics, dome ball and team practices, but also takes into consideration our young athletes’ second sport and other community-based commitments. This philosophy has served us well as our teams have consistently ranked very high locally and competed well at the national level.